Quiz-Quiz-Trade is a student favorite! 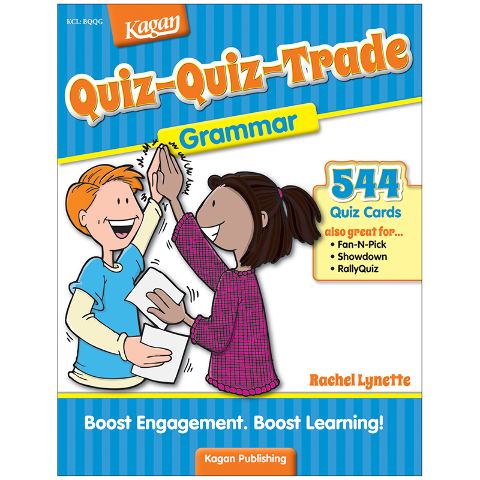 This Kagan Structure turns need-to-know curriculum into a fun and interactive quizzing game. 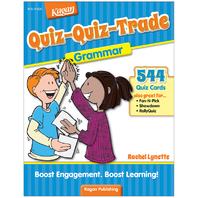 To play, every student receives a quiz card relating to the topic. Students then pair up with a classmate. Using their cards, they quiz each other. After coaching or praising, they trade cards and set off to quiz a new classmate with their new card. The repeated practice boosts retention of the content. Memorizing important information and concepts has never been so fun! Each book is loaded with card sets on a variety of topics. Each card set includes enough ready-to-copy cards for your entire class to play. 216 pages.